To begin with I hardly had any time left after seeing the Baptistery and anyways I didn’t expect anything out of the Campasanto other than some tombstones and tablets. I hardly had 1 hr left when I entered the Campasanto and I was just mindblown. The basic structure of the Camposanto is as usual, a square shaped one. One portion of the wall has some marble sculptures and guess what, these were the originals of the cast that I saw in Florence Uffizi Gallery! The whole corridor was filled with sarcophagi along the walls. There are ofcourse arches all along the wall like any other cemetery. But that’s not the eye-catching factor! 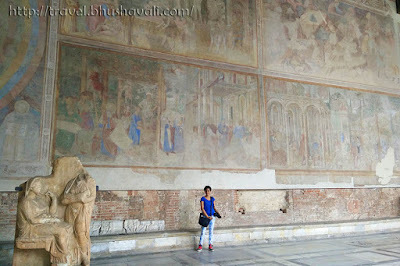 The entire wall is completely filled with murals, though not in a great condition & eroded a lot, it was just awesome! It was built in 1277 and the frescoes were made in 14th C by Francesco Traini and Bonamico Buffalmacco. 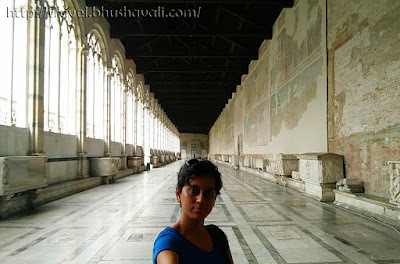 At that very moment I came to know that fact, I realized I was standing in front of frescoes that were older than Michelangelo’s Sistine Chapel which were painted in 16th C!!! Most of the subjects I did not understand and were from the Old Testament and the saints of Pisa! One particular panel that totally caught my attention was this panel about hell. Centrally places was a monster and all around it were humans going through various torture techniques in hell incl holding their own severed head, standing with their intestines pulled out, being fried and barbecued, being eaten by dragons and snakes – it was just gruesome at its worst!!! There was also a nativity scene and the Adoration of Magi. Another scene that I could understand was the building of Babylon! Especially the way the buildings and architecture was depicted was awesome. Reminded me much of Ajanta Frescoes though this more than a millennium newer!!! There are a couple of tiny chapels and a major chapel in this place. The 2 tiny chapels are called Chapel Ammannati and Chapel Aulla. Atop one of the tiny chapels was this outline design. I think the artist gave up before completing it! Then is the spectacular other chapel called Dal Pozzo. The moment I stepped into this Chapel, it was altogether a different feel. It was originally commissioned by archbishop of Pisa Carlo Antonio Dal Pozzo in 1594. Right above is the dome with the 4 Gospels painted in 4 corners. The shrine is of St.Jerome and has his Mural painted on the altar. Later in 2009, this became the Cathedral of relics and today it houses a whooping 80 relics including - eleven of the twelve Apostles, two fragments of the True Cross, a thorn from the Crown of Thorns of Christ and a small piece of the dress of the Virgin Mary. The entire place was golden in color. It was just mind blowing! As I said in the beginning, all I had was just 1 hr at Camposanto and the place was a pandora’s box for anyone who’s interested in art and history - murals, sculptures, relics, it was just too much for 1 hr!!!! Esp. the murals themselves need half a day!!! The courtyard is absolutely beautiful and made even more picturesque by those stunning statues! They look so lifelike! It's unbelievable that the frescoes have survived since the 14th century and I'm suprised by how graphic some of them are! It's a shame that you didn;t have quite enough time to see everything there but it's a good excuse to go back! Not sure how I missed this when I was in Florence. Have actually never even heard about it. Just the sheer fact that it was built around 1277 with all the ancient paintings and architecture is fascinating! I spent a month in Florence and didn't hear about the Camposanto. I think I missed out! The Italians really loved painting gruesome imaginations of hell, didn't they? I guess it keeps people in line. How cool to see some of the originals of the replicas you saw in Uffizi. Those murals are incredible. It blows my mind how artists can create things like this. I'm so glad you posted that last picture so I could see the scale. Wow, mind blown! The sculptures and murals are so beautiful and intricate. I wonder how you to managed to skin through in an hour. It would easily take me half a day to do so. Incredible murals and frescoes. The one about hell would be an eye-catching one and as well slightly shocking. I did not have enough time to visit anywhere apart from the Leaning Tower of Pisa as we were heading on a flight out of Italy shortly. I wish I would have seen the inside of the Camposanto. Some really interesting history to explore. I love how much history was in the Campasanto. Some of the photos are unbelievable! The sculptures are breathtakingly good! Very good article, thanks for sharing! The Italians never fail to surprise the world with their art and architecture. As is the case in the rest of the country, Camposanto looks full of historic beauty and talent that is still being admired till this date. Hopefully next time you get more time to explore it even further. The interior of Pisa Campasanto looks so full of history, I'll give myself longer than an hour inside when I visit! 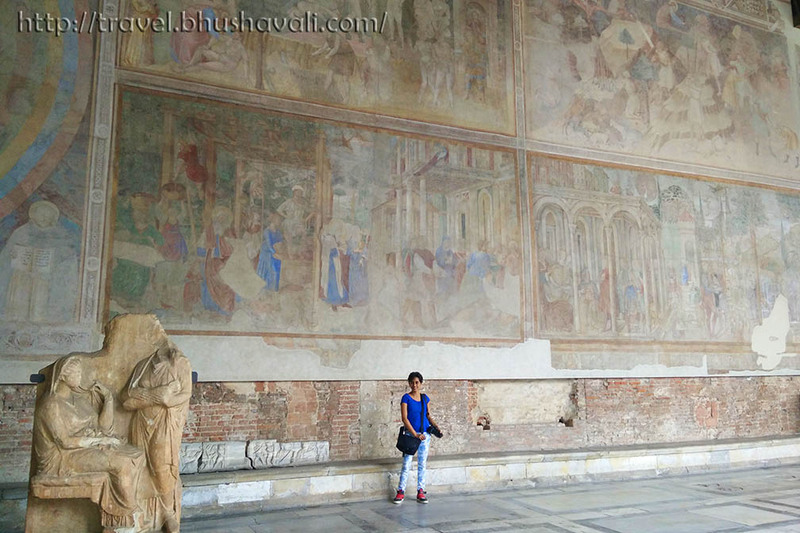 It's amazing that the Frescoes in here are older than those of Michelangelo’s Sistine Chapel! Your selfie inside show how big the interior is. Pisa Campasanto looks like a gorgeous place! I'd love to see the murals, especially the one about Hell. The statues are also beautiful. I'd love to go someday! Wow, it's amazing that these frescos still exist even after a long time. Those paintings about hell sounds interesting. What an incredible place this is full of art and history. I'd add Camposanto to my ever-expanding list of places to see haha. Wow, you truly have brought us with you. I haven't been to these beautiful scenery, and I'm so lucky to be able to read this. Visiting this place is truly my dream and for now I enjoy what you have shared. Your photos are always beautiful as always. Thank you so much for sharing this with us. These are awesome frescoes! I've been to Pisa but I missed out on seeing the Camposanto. I'll definitely make sure I visit next time - can't believe it's so old! Florence is a dream destination for any architecture lover. Haven't been there yet but would love visit someday. I loved those murals and thanks for the virtual tour. I felt like seeing it through your eyes! I love Italy, but I've never been to Florence. The pictures are stunning.